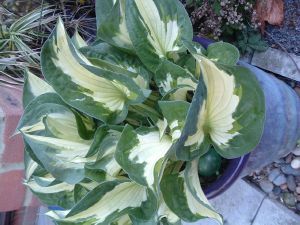 Hosta 'Whirlwind' is a medium size perennial with heart shaped, twisted, mixed white, yellowish-green leaves with deep green edges. Funnel shaped, lavender flowers bloom on straight, leafy 70cm stems in July. With a plant height of 60cm and a spread of up to 90cm, this Hosta provides bright colour in shade with its wonderful foliage. Hosta ‘Whirlwind' prefers to be planted in a shady area in any moist, well-drained area. This low care perennial is ideal for shady positions, tubs and patio pots. Hostas are herbaceous perennial plants, growing from rhizomes or in some species, stolons, with broad lanceolate or ovate leaves, varying widely in size by species from 3–45 cm long and 2–30 cm broad. Variation among the numerous cultivars is even greater, with clumps ranging from less than 10 cm across and 8 cm high, to more than 200 cm across and 130 cm high. Leaf colour in wild species is typically green, although some species (e.g., H. sieboldiana) are known for a glaucous, waxy leaf coating that gives a blue appearance to the leaf. There are over 40 different Hosta species and more than seven thousand named varieties. Hostas grow very well in British gardens, enjoying the temperate climate and generally high rainfall. Whilst their foliage is more luxuriant when grown in semi-shade and moist conditions, most need morning sunlight to gain their ideal size and some, with gold leaves for example, to achieve their best colouring. Some of the white variegated varieties sometimes scorch if grown in direct sunlight without adequate moisture. Once you own a Hosta, they require so little care really, just a reasonably fertile spot in the garden with good drainage below, some part shade during the day to not scald their leaves, and occasional watering during dry periods. Hostas will grow in virtually any soil, but do best in neutral to acid loam, treated with humus and being well mulched every autumn. Hosta are not prone to many diseases; their worst enemies are slugs and snails, which proliferate particularly in shady areas with moist soil. However there are many proprietary brands of slug and snail repellent/killer on the market to ensure that your plant remains resplendent throughout the growing season, and an early start with these in the season will pay dividends. Uses: Hostas are exceedingly popular perennials in today's gardens, due to their versatility in the landscape. Their subtle colours, tall flower stems, and broad, coarse leaves fill a niche in garden designs that few other plants can achieve. Their generally large leaves provide excellent coverage for dying bulb foliage. Pruning \ Aftercare : Remove flower stems after faded.